All signs point to new Apple notebooks Real Soon Now: Apple is limiting shipments to Best Buy and has ordered new circuit boards, and Intel recently released its mobile Centrino 2 platform and promises its first quad-core mobile CPU in August. There's also rampant speculation about the hinted-at "product transition" that's going to reduce Apple's margins in the coming quarter. Will Apple slash prices to compete with HP and Dell? Will it introduce a Mac Tablet? Will we finally see a low-end desktop Mac? Apple Limiting MacBook Shipments to Best Buy, New MacBooks Soon? Apple Buys More Circuit Boards - MacBook Refresh Imminent? Circuit Board Orders Point to New MacBooks? What's Apple's Big Mystery Product? MacBook touch Coming in October? 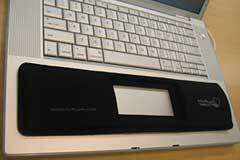 Apple to Launch MacBook touch? "Rumors are swirling about new MacBooks and MacBook Pros, with recent reports of increased notebook circuit board orders and limited shipments to Best Buy over the next two weeks. Intel's introduction Monday of its new Centrino 2 platform has been considered the last hurdle in the race to new MacBooks, which were rumored for a possible WWDC introduction in June before Intel delayed the Centrino 2 launch." "More evidence has emerged that Apple's about to refresh its laptop line-up: the company is claimed to have upped its circuit-board orders by 20 per cent. "So say sources cited by Chinese-language newspaper the Commercial Times. That increase is over and above the volume of PCBs Apple is said to have ordered for Q2." Link: Apple Buys More PCBs - MacBook Refresh Imminent? "It could be time for Apple to bring the aluminum MacBook Pro casing to the MacBook. "With the iPhone 3G launch out of the way, it's time to turn to what appears to be the next big thing on Apple's road map for the year: new notebooks." Link: Circuit Board Orders Point to New MacBooks? "Apple is said to have increased its procurement of notebook-use printed circuit boards (PCB) by 20% on quarter in the third quarter, with most of the ordered PCBs being high-interconnect density (HDI) boards . . . according to a Chinese-language Commercial Times report...."
"Amid all the chatter about Apple's fiscal third quarter results, which were strong, most concerns about the future revolve around two words: Gross margins. The big takeaway for technology buyers: Those lower margins hint at cheaper iPods and notebooks in the not-too-distant future. "Following Apple's typical strong quarter with a side of conservative guidance (Techmeme), CFO Peter Oppenheimer and COO Tim Cook noted that gross margins would be 31.5 percent for the September quarter and about 30 percent in fiscal 2009. It could be that Apple is lowballing again with its outlook, but there are good reasons to think that your Mac notebooks and iPods will come cheaper in the future. "Bottom line: If you're in the market for an Apple iPod or notebook a little procrastination may not hurt, given the company's comments." ...However, with the upcoming Snow Leopard, having a quad-core laptop will make even more sense. One of the additional benefits is that increases in performance from better use of multi-core chips will extend the usable life of the hardware further. Virtualization is another big place where multi-core chips will play a big part. "'Grand Central,' a new set of technologies built into Snow Leopard, brings 'unrivaled support' for multicore systems to Mac OS X...."
"Apple's tease of a 'product transition' in the works sparked debate among pundits Tuesday about what the Mac and iPod maker may be planning. "In a conference call Monday, CFO Peter Oppenheimer told financial analysts that product development contributed to a drop in gross margin in the fiscal second quarter to 34.8%. Moreover, the 'product transition' would help push the margin, also known as gross profits, down further in the current quarter to 31.5%, and keep it around 30% in fiscal 2009. "Oppenheimer declined to provide even a hint of what Apple is working on, but promised it would be 'state of the art' and unmatched by rivals. Those comments sparked a firestorm of speculation among Apple watchers on the Web...."
"What exactly is next for Apple's product lineup? What blockbuster product announcement is next for the Cupertino, Calif., computer company? Speculators are going wild today trying to figure out exactly what is going on. "This is all because of Apple's earning call late Monday afternoon. Apple CFO Peter Oppenheimer said the numbers were great for the last quarter but warned about a 'future product transition' as a big reason that Apple expected slightly worse profit numbers in the fourth quarter. "Apple's stock dropped $14.13 (or 8.5%) to $152.16 afterhours Monday night. "But what is that 'future product transition' all about?...." Link: What's Apple's Big Mystery Product? "'We believe there is an 80% chance Apple will introduce redesigned MacBooks and possibly new MacBook Pros at lower price points,' he wrote. 'Specifically, Apple may re-enter the $999 price point (currently $1099) with the MacBook, or test the $1,799 price point with the MacBook Pro (currently $1999).'...." "Think MacBook screen, possibly a bit smaller, in glass with iPhone-like, but fuller-featured multi-touch. Gesture library. Full Mac OS X. This is why they bought P.A. Semi...."
"As an analyst pointed out in one of our earlier posts, a MacBook touch would certainly be plausible, given that Apple has already developed Cocoa Touch for iPhone and could likely implement it into a tablet. A MacBook touch would essentially be a larger, more powerful iPhone, after all...."
Link: Rumor: Apple to Launch MacBook touch? "Since Apple's third quarter conference call, the rumor mill has been grinding its latest batch of corn: or what natives call 'the MacBook tablet.' The endless list of features, the bad Photoshop: It's already here. "Every time Apple has whetted our appetites for new products, the same people keep predicting a tablet-style device, and, since the Newton, they've yet to be right. "Join me for a medium-sized rant about this Mac tablet, why it's a bad for Apple, and why they won't sell it...."
"Cell phones and tablet computers are all about freeing ourselves. Sure you can bring a laptop on a camping trip or into the grocery store - but an iPhone or a small tablet Mac work much better on the go. So, say 'Yes' to tablets. In fact, say 'Heck Yes'...."
"In June, we were reporting about a new TruePower battery from FastMac and dedicated to MacBook Pro 15". Its nominal capacity was higher than the one offered by Apple, and its stability over time is indeed superior to the original one. "So after 60 cycles, and a complete recalibration, we obtained the following results...."
"Planet small biz, meet the netbook: a quick and relatively cheap portable computer that not only gets your small business more virtual but keeps your people off the road - and away from burning pricey fossil fuels. "'Netbooks' (networked notebooks, get it?) are part of new product angle from big laptop vendors like Hewlett-Packard, (HPQ - Cramer's Take - Stockpickr), Lenova (LNV - Cramer's Take - Stockpickr) and Dell (DELL - Cramer's Take - Stockpickr). The marketing notion here is to create a line of computers with average computational power suited to run both standard business applications and the new generation of online business process apps delivered via the Web. 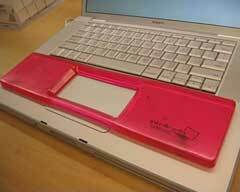 "...Netbooks are relatively light, around four pounds. They're nothing like the under-two-pound ultraportables, but lighter than the eight-pound-plus desktop replacements. They are relatively cheap, starting in the $500ish range, with properly configured units running around $700. Again, not as low-cost as super-discount notebooks, but far cheaper than high-end portables like the MacBook Air from Apple or the Toshiba's r500." "The Round Rock vendor said it will pre-load the Ubuntu operating system on two new boxes, starting early next month. "It's also arming its current selection of Ubuntu PCs and laptops with an updated version 8.04 (AKA Hardy Heron) operating system. "Just in time for the LinuxWorld expo in August, Dell customers will be able to purchase XPS M1530n and Studio 15n laptops with Ubuntu installed. (The n at the end means it's a non-Windows system.)" PR: Computer Intelligence, Inc. has launched its Intelligels line of wrist rests for laptop computers. These patent-pending wrist rests were designed to differentiate themselves from the dozens of different wrist rests sold for desktop computers and the few sold for laptops. The goal of this unique design is to provide comfort and relieve the pain and discomfort in the palms and wrists while typing on a hot and hard laptop case. While simple in appearance and design, Intelligels offers two versions of the wrist rest, SoftGEL and Lycra nylon SoftFOAM. Intelligels' one-size-fits-all fits a majority of laptop computers and provides ergonomic support and exceptional, soothing wrist comfort for Apple, H-P, Dell, Sony, Toshiba and all 12" - 17" wide screen laptop/notebook computer brands. Mouse touch pads and click buttons work seamlessly with Intelligels. Michael E. Zuckerman, CEO and founder of Computer Intelligence, Inc., has been in the computer industry for over 25 years. As a business analyst, IT developer and road-warrior consultant he has spent many hours working uncomfortably on his laptop and began to experience signs of carpal tunnel syndrome. As a direct result of this and unable to find anything in the market to solve his problem, Mr. Zuckerman designed Intelligels laptop computer wrist rests. With the two styles Computer Intelligence offers a broader selection of product solutions for the consumer, whether student, road-warrior or gamer. 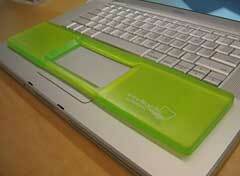 Place the rectangular-shaped Intelligels directly on the case of the laptop where you rest the heels of your hands. In the center is a one-size-fits-all cutout area so you can access your integrated touchpad and mouse click buttons. Both work seamlessly with Intelligels. SoftGEL Intelligels is composed of polyurethane gel for a soft supportive feel while offering a cool feel to your hand. The available colors are lime green, red, orange, blue, pink and black. Therefore, you can add your own personal touch to your computer and keep up with market trends in laptop colors from leading manufacturers. SoftFOAM Intelligels is a Lycra nylon covered rest injected with soft foam on a rubber nonskid base. This too provides excellent ergonomic comfort and relief with a curved resting position for the heel of you hands and more cushion. Lycra SoftFOAM rests are available in black, grey and navy blue. Both wrist rests do not slip and stay in place while resting on your laptop for more control. Then you can remove and store the Intelligels when not in use. As noted on the US Department of Labor's OSHA's website concerning the proper positioning of your hand/wrist in the use of computers: "Your hands should move freely and be elevated above the wrist/palm rest while typing. When resting, the pad should contact the heel or palm of your hand, not your wrist." Intelligels laptop wrist rests are designed to provide this exact type of support. Places laptop computer user's hands in an ergonomically correct, comfortable typing position. Provides superior comfort and support for your wrists and hands while using a laptop. No more typing directly on hot, hard laptop computer cases for hours. Keeps palms and hands cooler and more comfortable while you use your computer. Reduces wrist strain and may reduce the risk of carpal tunnel syndrome and repetitive stress disorders. Integrated mouse touch pad and both click buttons work seamlessly with Intelligels soft edge. notebook in complete relaxation wherever you want: in an armchair, on the sofa, on a chaise-lounge or even better - in bed. The aeration holes and the ability to incline the support tray will allow you to find the perfect position for your Notebook, with efficient ventilation system to help keep your 'Book cool. The micro-table "Lounge-pod" is ideal to support and maneuver an external mouse or to keep your mobile phone even better a drink handy. The base supports at the end of the Lounge-book are very small, only 3 cm, which allows placing Lounge-book more or less anywhere and perfectly positioned. Lounge-book is more than an accessory, it's a piece of industrial design art added to your furniture, that integrates your notebook with the personality of your house and of your living. You have the maximum freedom in finding your ideal combination thanks to the availability of seven models. It's the ideal method for a relaxed use of the notebook, comfortably lying in the most ergonomic position you could have. Its not by chance that the company logo has been designed to show this position. 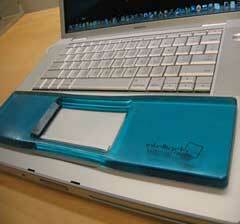 It symbolizes the perfect philosophy of the comfortable and ergonomic use of a notebook. The Lounge-tek approach goes far beyond the function of the technical instrument to arrive at a real and proper lifestyle. At home or in an hotel, Lounge-book allows you to do what you've always wanted to do with your notebook, but unlikely managed to do it - comfortably using it lying on your bed. The 35-degree inclination permits the support to be regulated in an optimal way to work with your notebook from a horizontal position and at the same time guarantees the best air flow for the cooling outlets of the computer. The suspended structure allows you to locate Lounge-book at the right height to avoid putting weight on your body and at the same time to reach the keyboard with your fingers by leaning on your elbows, guaranteeing a natural position for your arms and head. Completing a report or chatting with friends from your armchair in the lounge? To finish the day in total relaxation there isn't anything better. You can position your Lounge-book as you wish thanks to the versatility of the structure and the adjustable supports that let your body find the best position. In front of the TV or in group, using a notebook for work or fun has never been so comfortable. Even if you are a freelance and use the notebook all day or a normal user with a less advanced laptop, Lounge-book will ensure comfortable use. On a deck chair either in a garden or on a terrace, Lounge-book gives the best performance: the adjustable structure adapts to any height, while the Notebook support can be perfectly regulated to respect the chosen inclination: and if you don't use Lounge-Pad for the mouse or to support your mobile phone, you have the space for a drink. Even outside the Notebook becomes a pleasant distraction or a comfortable workmate. With Lounge-book you can use your notebook in the peace of your garden or verandah, connected to a wireless world. Working near the swimming pool, on the deck chair, you need only a Lounge-book and a cool drink- the Lounge-book way of life. Lounge-book has been designed and realized in Veneto, an extraordinary region of Italy where a brilliant network of professionals gather, with ethics, traditions and innovation and a deep culture of quality and respect of the rules. A new way to make business that uses the territory and the innovation available to compete better on the market, eliminating the useless costs that weigh down the quality of products or increase prices for the buyer. All the production phases are developed in the respect of current laws, using materials and varnishes approved by the European Union in terms of protecting workers' health. Lounge-tek started the lounge-book project targeting relax and comfort as primary objectives but in developing the idea they also found many ergonomics issues that this product can help address. A Lounge Book Standard costs 99.00€ + transport 15.00€ =114.00€ or about $180 at current exchange rates including Duty and Tax and UPS delivery. Delivery takes approximately a week. 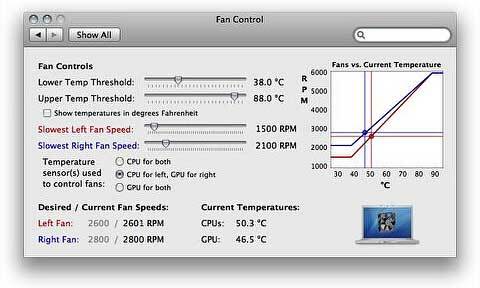 PR: Hendrik Holtmann's smcFanControl is a tool to cool down your Intel Mac and monitor temperature and fan speed. 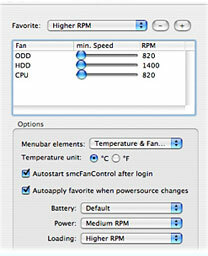 smcFanControl lets the user set the minimum speed of the build in fans, so you can increase your minimum fan speed to make your Intel Mac run cooler. However in order not to damage your machine scFanControl lets you not set minimum speed to a rate under Apple's defaults. Improved temperature-sensor readout on Mac Pro and iMac 24"
PR: Do you think your MacBook (Pro) is running to hot? Give Fan Control a try then. Some MacBook (Pro) are just to hot for daylong use. 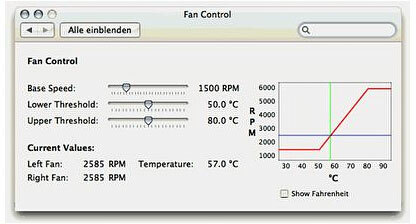 Fan Control adjusts the minimum fan speed depending on the current CPU temperature. For safety, it leaves the original automatic fan speed control intact. Fan Control is Open Source, distributed under the GNU General Public License (GPL). The sources are included in the download. Costs: Fan Control is free. Donations gratefully appreciated. PR: With the upgrade to 10.5, the developer's Intel-based iMac was left without a fan-control solution that worked adequately. To that end, he decided to modify the open source (GPL) FanControl to work with the iMac. The result is two new versions of Fan Control, one optimized for the Intel-based iMacs and one for the MacBook/MacBook Pro. MacBook Airs are back on the ACR site this week with price reductions, 15' MacBook Pros are back too, and there are both 2.33 GHz and 2.4 GHz 17-inchers for $1,899 as well as three MacBooks. Each model comes with an Apple one-year warranty, and ground shipping is free.